I'm just full of news lately, aren't I? The folks at JCaroline Creative have announced their biggest sale ever, now through July 10. Hundreds of fabrics, ribbons, and craft goodies are discounted. Including Kokka fabrics at nearly half off, and you can save a few dollars a yard on my prints, too. 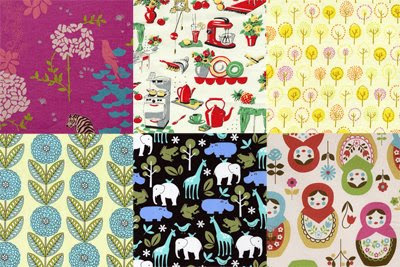 Ooooh, I'm all over this :) Just ordered some fabric for a pillow making frenzy this weekend! The frenzy sounds excellent. Have fun. hey jessica! i'm desperate for more of your leaf print green ribbon that is no longer available from jcaroline! any thoughts?? Uh, email Caroline and beg her to print more? Or see if she knows any other shop that has purchased it from her to sell? I have none! Missmagoo:I have some ribbon and might consider parting with a teensy bit. Maybe.... contact me and we'll talk. Yea, thanks for the info. They have cool stuff. I'm doing a bunch of home dec. projects right now and my ironing board is on my list for a new cover! I was inspired by the blogger who writes katie did journal. You should check out her blog. It will make you want to sew. what is the nesting doll fabric called? so cute! thanks for the headsup. Can't recall the name, but it was by Kokka. And now I don't think it's listed anymore, so it must have sold out in the last couple of hours. Sorry! I've been wanting to make a fabric order. :) I've never heard of this site. I'm going to check it out right now!! the link isn't working for me. Am I the only one having problems? Thanks for the tip! I have been checking out fabrics for our new baby's nursery - it's all so overwhelming. So much great stuff! Hi! What is that fabric in the lower left corner? The blue flower striped one? It was from the Flights of Fancy collection by Paula Prass for Michael Miller, but I see that one must be sold out, too, because it's not on the site anymore! But I bet if you Google you could find it somewhere else. And Lisa, wow. I checked out Katy Did. Holy cow. I want to be her. Hi Jessica! Just commenting to say how much I love the green mousepad with the leaf design that I bought from your etsy shop. It matches perfectly with the green filing cabinet in my study (if I were a designer instead of a scientist, my design blog would totally be called "How About Green"). ;-) Thanks again! Oh geez, just when I vowed I would try to use up my stash before I bought more fabric....oh well - this is too good to pass up!